In the early spring of AD 118, Hadrian reached the Danubian province of Lower Moesia (present-day Dobrudja in Romania). This territory, located between the lower Danube river and the Black Sea, was established as the province of Moesia in the last years of Augustus’ reign and later separated into two parts (Upper and Lower Moesia) in AD 86. Map of the Limes in Moesia Inferior. Shortly after Hadrian’s accession, a political and military crisis broke out on the Lower Danube. In Dacia, Trajan’s most significant conquest, the illustrious Roman general Quadratus Bassus had died during a campaign, either against the Dacians or their Samartian neighbours, the Roxolani and Iazyges. Upon receiving notice of the events unfolding, Hadrian, who was in Antioch at the time, sent the armies ahead and soon set out to Moesia himself. According to the Historia Augusta, the reason for the uprising was that Hadrian had reduced the subsidy (stipendium), which Trajan had consented to pay them by treaty. The Sarmatians and warriors from the Roxolani tribe fighting in units of cataphracts on Trajan’s Column (scene 37). The elite warriors of the Roxolani fought on horseback. Their body-armour consisted of cataphracts, leather tunics sewn with small iron plates and their horses were covered in similar material (S. F. Ryle, Rome and the Roxolani in Tacitus, “Histories I”). Upon his arrival in Moesia Inferior, Hadrian negotiated with the Roxolani the new terms of their relations. With the help of his trusted subordinate Q. Martius Turbo who Hadrian had appointed as governor of Dacia in replacement of Avidius Nigrinus, the emperor was able to restore order, and an agreement was soon reached with the Roxolani king, Rasparaganus. Hadrian agreed to increase Rome’s annual subsidies which Trajan had consented to pay the Sarmartian tribe. Hadrian’s next action was to abandon the eastern section of Trajan’s Dacia which was given back to the Roxolani. As a result, Moesia Inferior reverted to its original boundaries it possessed before the acquisition of Dacia. In collaboration with Turbo, Hadrian then reorganised the area and divided Dacia into two separated provinces of different status in the hope of making the province more manageable and less rebellious. Inscription in honour of Turbo from Ulpia Traiana Sarmizegetusa. These new regions were called Dacia Inferior and Dacia Superior (with its capital at Colonia Ulpia Traiana Sarmizegetusa). Hadrian also withdrew the Roman army from the western plain leaving the whole plain to the Iazyges and moving back the west border of Dacia. Map of Roman Dacia showing the territory returned to the Roxolani in 118 AD. In addition to establishing peaceful relations with the Roxolani, Hadrian granted their king Roman citizenship and recognised him as amici populi Romani. Rasparaganus took the name Publius Aelius Rasparaganus, in honour of Hadrian. It is believed that Rasparaganus was later exiled from his country and found asylum in Pola (modern-day Pula in Croatia), in the Roman province of Istria. An inscription from a sarcophagus found on the Uljanik Island, a small island in the harbour of Pula, records the name of Rasparaganus. It was found together with the sarcophagus of his son, Peregrinus. Tondo on the Arch of Constantine depicting Hadrian on horseback hunting a boar. In return for these concessions and favours, Rasparaganus may have given Hadrian a valuable gift; a splendid horse. It has been suggested that Hadrian’s horse was named after the river Borysthenes (today’s Dnieper) which flowed through the land of the Alani, the neighbours of the Roxolani who occupied the steppe region northeast of the Black Sea. 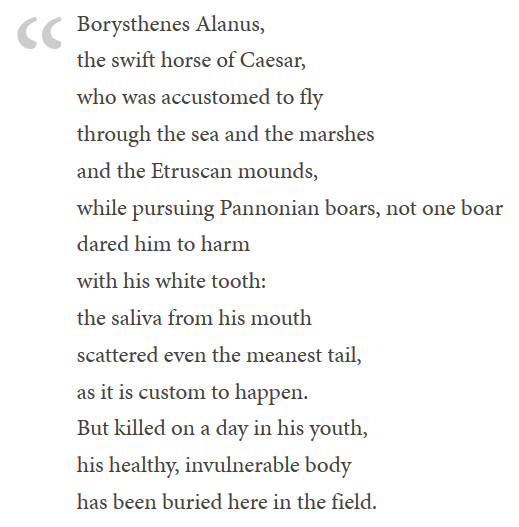 Strabo noted that the Alan horses were ”small” but exceedingly quick and hard to manage”. Borysthenes’ name was to be preserved for posterity thanks to an epigraph (CIL XII 1122) inscribed on its tomb at Apt, near Nimes, in present-day France (the ancient Apta Julia on the Via Domitia). Indeed, only three years after receiving the animal from Rasparaganus, Hadrian’s favourite hunting-horse was to die in the Gallo-Roman town of Apta Julia during a boar hunt. The inscription, carved in stone as a part of Borysthenes’ funerary monument, was found broken in two pieces at the beginning of the seventeen century and was transcribed by contemporaries, most notably by French antiquary Nicolas-Claude Fabri de Peiresc. Cassius Dio and the Historia Augusta inform us about the emperor Hadrian’s passionate devotion to his horses. Hadrian even acquired the services of an Iazygian prisoner of war, a certain Mastor, who was a skilled huntsman. According to Dio (69, 10.2), Mastor was employed by Hadrian as a hunting companion “because of his strength and daring”. He would remain in Hadrian’s service for the rest of his life. With his new favourite horse and assisted by his Iazygian huntsman Mastor, Hadrian was ready to indulge his passion for hunting. Anthony R. Birley suggests that the negotiations with Rasparaganus were probably conducted at the town of Troesmis (modern-day Iglita in Romania) near the delta of the Danube (or possibly at one of the cities on the Pontic coast, Tomis, Histria or Callatis). Troesmis had two administrative units, the civil settlement (civitas Troesmensium) and the military settlement (canabae) around the fortress of the Legio V Macedonica, the legion which Hadrian had served as military tribune twenty years earlier. Troesmis would also have been a good place for him to supervise the withdrawal of Roman garrisons located to the north of the Lower Danube. 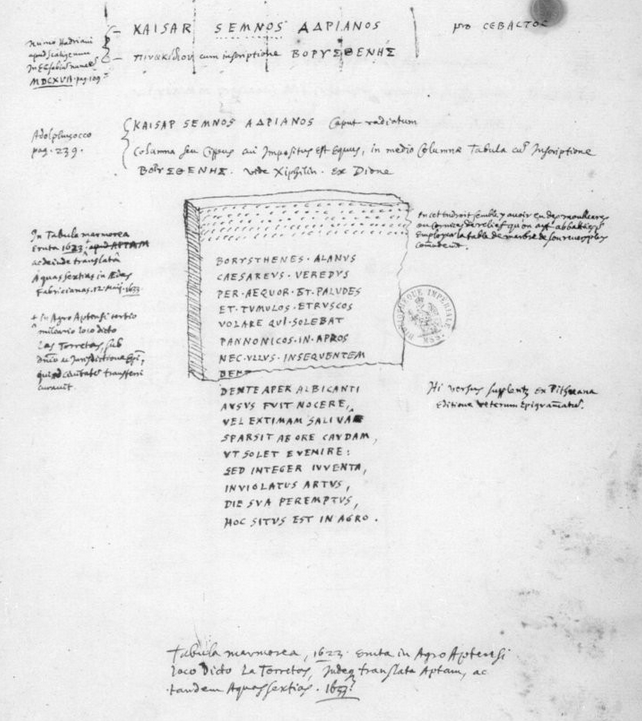 Troesmis on the Tabula Peutingeriana. Troesmis is well attested in ancient literary sources. Its earliest mention was by Ovid in one of his letters from Pontus (IV, 9, 78-79), in the context of the Geto-Dacian hostilities of AD 15. He described the town as a Thraco-Getic fortress of the pre-Roman period. Later, Ptolemy attests that legion V Macedonica was quartered there. The economic importance of the fort is attested by its inclusion into the Late Roman road-maps, the ltinerarium Antonini and the Tabula Peutingeriana (segm. VII). Troesmis is mentioned again in the 6th century by Procopius (De aed. 4.11.33) who numbered Troesmis among the cities reconstructed by Justinian. The earliest epigraphic evidence for the Fifth Macedonian Legion in Troesmis dates to the time of Hadrian. The legion took part in Trajan’s campaigns against the Dacians (101-106), and after the conquest of Dacia (or possibly even before the end of the war), it was transferred from Oescus to Troesmis to defend the limes in this part of Moesia Inferior and keep an eye on the Roxolani. During the Parthian and Marcomannic wars in the 160s, the legion left Troesmis and established a new garrison in Dacia, at Potaissa. After that, at the end of the reign of Marcus Aurelius, between 177 and 180, Troesmis became a municipium and was garrisoned by a detachment of legio I ltalica, and, according to epigraphic evidence, by a detachment of the Classis Flavia Moesica. Its strategic point later made it an important Late Roman and Byzantine fortification. The wide-spread area of the ruins extends from the Danube river to the east up to the Western slopes of the Măcin-mountains. However, the site has suffered much decay due to the fluvial erosion, the exploitation of local natural resources and land developments, as well as being currently in an advanced stage of degradation. View over the Danube with the Măcin Mountains in the background. The site is dominated today by the visible remains of two fortifications (actually fortresses), the so-called Eastern fortification dating back to the 4th century AD, and the Western fortification, presumably erected in Byzantine times. Between the two fortifications stood the fortress of legio V Macedonica of Hadrian’s time. The Late Roman Eastern fortifications of Troesmis showing the visible ruins of the horse shoe-shaped tower from the northeastern side and of the corner tower wall segment. The so-called Eastern fortification had a rectangular shape (120 x 145 m). The southern side leaned on the steep Danube bank, and the defensive system was completed by exterior semicircular towers and by a vallum and a ditch. The western fortifications of Troemis erected in Byzantine times. The so-called Western fortification stretched about 400 m away and had a trapezoidal shape (150 m on the long sides and 100 m and 80 m on the short). It was defended by exterior semicircular towers, and a natural ravine to the north and a deep ditch to the east. Eastern City Plan after Revue Archéologique 7 (1868), pl. IX cf. Gr. Tocilescu, 1883, p.104. Archaeological research started as early as the 1860s by several French missions to the Lower Danube with the task of documenting the Roman fortifications. It was at this time that the site was identified with Troesmis thanks to numerous inscriptions from the 2nd and 3rd centuries found there that were used as spolia. The earliest inscription dates to the time of Hadrian and is dedicated by magistrates of the canabae legionis to Iupiter Optimus Maximus and to the health of Hadrian (CIL 03, 06166). Until recently, only limited evidence for the pre-Roman or early-Imperial Troesmis existed. The only remaining visible traces at Troesmis were datable to the 3rd century onwards. However, the latest archaeological research conducted in the area by a Romanian-Austrian research project managed to localise the fortress on the plateau between the two later fortifications by using magnetic prospection (scanning the earth magnetic field at the surface). Reconstruction possibilities of the front side of the Troesmis castra. The terrain map is based on Airborne Laser Scanning data from 2013 (© 2015 Gugl / Kainrath / Grabherr). View of the plateau between the two fortifications where the legionary fortress was located. The recent field research also established the level of destruction of the site in the 19th and 20th centuries following the establishment of quarries and the building of a railway as well as archaeological poaching. View of the modern limestone quarries that damaged the sector near the legionary fortress. The most spectacular ﬁnds from Troesmis have been two bronze tablets containing the laws of the municipium, the lex municipalis Troesmensium, issued during the joint reign of the Emperors Marcus Aurelius and Commodus (AD 177-180). These artefacts were discovered following a series of illegal excavations in 2002 (see press release here). They were sent abroad to be sold but were repatriated to Romania in 2015. According to historians, the objects represent the most important written document belonging to our ancient history and originating on Romanian territory. I don’t want to be a Florus, Stroll about among the taverns, Lurk about among the cook-shops, And endure the round fat insects. After Hadrian was able to restore order across the frontier and managed to established peaceful relations with the Sarmatian tribes, he moved west along the Danube frontier where he would remain to review his troops throughout the spring and into the early summer of AD 118. Alexandrescu, C. (2016). Troesmis – a changing landscape. Romans and the Others in the Lower Danube Region in the First Century BC – Third Century AD, C.-G. Alexandrescu (ed. ). Biblioteca Istro-Pontică – Seria Arheologie 12 (Tulcea 2016). I have been meaning to write to you for a while to congratulate you on your Hadrian project. It’s a fantastic concept, you’re doing it really well and I only wish I had thought of it first! It must be very rewarding for you. Another reason I’m writing to you is that a few years ago I had an idea for a writing project that also had to do with Hadrian, or more specifically, about his mausoleum. I didn’t come close to completing it, unfortunately, but I did write a bit about Hadrian. A few months ago I found this piece of writing in a long-forgotten folder on my laptop and I was wondering if you might be interested in publishing it on your site. It’s about 2500 words and still incomplete, but if you were interested in it, I would try to finish it. Conceptually, the article introduces Hadrian and some of his interests and legacies, and links Hadrian with Augustus in areas like frontier defence and – ultimately – tomb-building, which is the underlying theme of the article. If you’re interested, I could send you a sample and then we could go from there. If not, no worries at all. Best of luck with the continuation of your project. Congratulations on your video! You can send me your piece via email at madge@hotmail.fr.